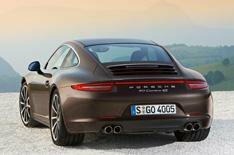 2012 Porsche 911 Carrera 4 revealed | What Car? The Porsche 911 Carrera 4 and Carrera 4S have been unveiled before they go on sale in December. The new four-wheel-drive models are available in Coupe and Cabriolet forms and look subtly different to existing rear-wheel-drive versions, with 22mm wider wheelarches and an additional thin red lighting strip between the rear lights. They also have wider rear tyres. A seven-speed manual gearbox is standard; Porsche's PDK twin-clutch transmission is available as an option. The Carrera 4 has a 345bhp 3.4-litre engine, whereas the Carrera 4S has a 394bhp 3.8. Standard equipment includes leather upholstery, satellite-navigation, climate control and xenon headlights. Porsche has added new options to the 911 to coincide with the launch of Carrera 4 models: Adaptive Cruise Control (ACC) is now available across the range, and a sliding glass sunroof is now available for Coupe models.